Waking at 5am and not getting back to sleep this morning really kinda sucked. So after I hustled the kids off to school I decided to take TD for an early walk so I could spend the day writing. As I got down the block I realised how hungry I was. The rest of the walk was spent daydreaming of what I would make when I got back. I just chopped some bacon, a scallion(shallot) and some red pepper and sauteed in a pan then threw the beaten eggs in. 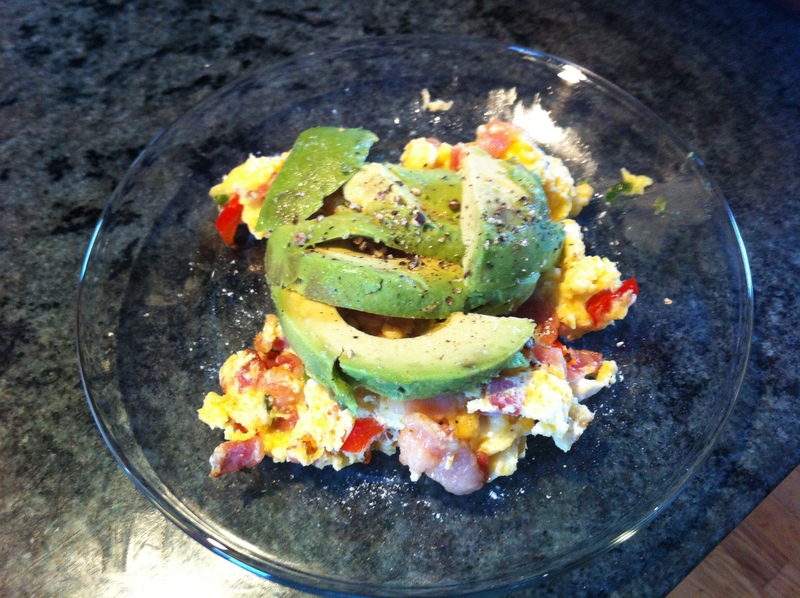 Once served I sliced half an avocado and topped the eggs, added some salt and fresh ground pepper and voila……. breakfast in about 10 minutes. Coffee too of course.